There are few more stirring sights and sounds in Scotland than the pipes, drums and dress tartans of a pipe band. 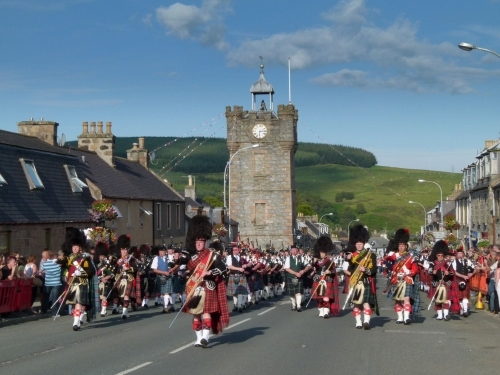 We are fortunate enough to have our own small pipe band in Dufftown. Come and hear them play in the Square or in The Royal British Legion during summer evenings. The Great Highland Bagpipe originated in Scotland around the end of the 15th century. Early accounts tell how it was taken into battle to rally the troops and encourage them to greater efforts. By the 1850's pipers were an established part of the British army, with each battalion of the Highland Regiments being allowed five pipers and a Pipe Major. Pipe bands usually include a bagpipe section, snare drums, tenor drums and a bass drum. The traditional uniform includes kilt, hose and dress shoes as well as jacket, waistcoat, shirt and tie. The Pipe Major often has a more elaborate uniform than the rest of the pipe band.